In case you have missed out on our previous segment of the series to get started as a transcriptionist, please check it out first before going any further. 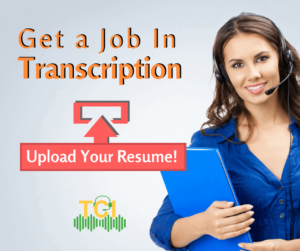 After you accomplish the first step of learning transcription, we know what you're thinking... how to get a job in transcription. Now, it's time to figure out how to get a transcription job and start making money from home. Let's begin with the job requirements. The next important thing you're going to need as a transcriber is transcription equipment. Well, we've already covered this in another article about the necessary equipment for transcribers and resources to get them. So, just check that out. Before we step into “how to get a job in transcription”, let's go through a few important things you might find interesting: the trends in transcription employment. Transcription is one of the most important services on which many people, different industries, businesses, and government organizations rely upon. If you see the stats, you will find out why transcription employment will not go out of trend. Not just this, the transcriptionist jobs are also ideal for an uncertain economy. Here you can learn more about why a transcription job is ideal in an uncertain economy. How to Get a Transcription Job? Before you start applying for transcription jobs, you are going to need a professional resume focused on your transcription skills. Creating a highly professional resume is the first step towards getting shortlisted by transcription companies. If you are looking for tips on how to nail the transcriptionist resume, you should take a look at this guide. One can also get a transcription job as a side-gig to earn some extra cash. When it comes to students, this seems like an ideal job for them as it requires little or no prior experience. Here's how college students can earn good money with transcription work. The increasing demand of transcriptionists, especially in the general transcription industry is making it challenging for transcribers to land a gig. So, you need to stand out from the crowd in order to beat the competition for transcription jobs. Let's see how you can do it. How to Beat Competition For Transcription Jobs? Stand Out from the Crowd! If we talk about a transcriptionist, they face a variety of challenges to get a transcription job. Even after you become a transcriptionist, you still have to go through this. If you're curious, you can find out here about the challenges faced by general transcriptionists today. So, you are ready to go on… that means you need to work harder as nothing worth having comes easy. To be successful in this industry, you need to keep up with the latest transcription technologies. This can help you improve your turnaround time or TAT up to 2 to 3 times and so will your demand. Here's a guide that will help you understand how you can beat the competition in transcription using the latest technologies. 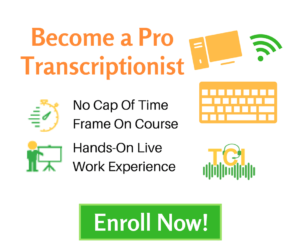 Not just this, learning about the strategies to market yourself as a transcriptionist also plays a significant role in getting a transcriptionist job with top transcription companies with the highest rate of pay. Becoming a professional transcriptionist needs you to go to the next level with your work as well as a few other things. Let's see what separates an average transcriptionist from an outstanding one. One of the most important factors that support you to become a professional transcriptionist is to raise your performance bar. If you want to learn more about this, please go through the given suggested reads below. Things a General Transcriptionist Should Never Do - You will learn here about the common mistakes of newbie transcriptionists that will leave a bad impression on employers or clients. Staying Productive While Transcribing at Home - Find out the techniques you should follow as a work from home transcriptionist to stay productive and efficient. Realize Your Earning Potential Through Transcription Work - It often happens with newbie transcriptionists that they do not realize their earning potential. Find out the steps to reach your goal of self-employment. Everything About Transcription Guidelines for Transcribers- Following transcription guidelines is very crucial for transcribers. Here, we have compiled the common things you need to consider while following the formatting guidelines. A 12 Point Checklist For Proofreaders Who Write Content Too - After every transcription work, transcriptionist need to look over for any errors. This checklist for proofreaders will also help you as a transcriptionist to provide error-free transcripts. Tips to Identify Homonyms Accurately While Transcribing - While transcribing, transcriptionists often encounter homonyms, words that sound alike. It's important to accurately identify homonyms in order to avoid any errors in your transcripts. The Power of Punctuation - Punctuations are important to create sense and clarity about what actually is being said in a particular sentence. While transcribing, a transcriptionist needs to be highly proficient in using proper punctuation in their transcripts. The transcription industry offers blessings of opportunity to grab on to and get unexpected bonuses. You can get a transcription job, work as a freelancer, or independent contractor on a part-time or full-time basis. Not just this, you can even set-up your own home based transcription business. Here are a few very useful resources, if you want to pursue your dream to become an entrepreneur from home.